Question: What impressions did you get from the fair? 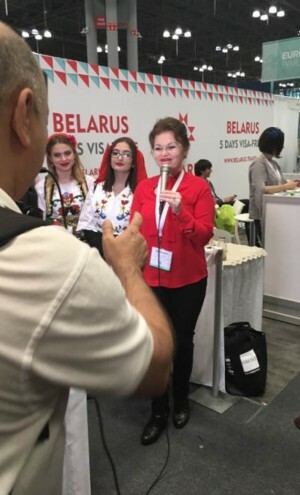 Mrs. Dudaj: It was a very valuable experience, a necessary experience for our business existence, and we were very enthusiastic, even before our participation. This representation was part of our independent, business and marketing plan strategy. Adriatik Tours LLC, to represent as the newest DMC in the USA, touristic Albania. Our office staff, Angel, Mena, and also two other experienced travel professionals, Pepi & Jason, made possible with their professional co-operation, to make our presence more effective and successful. 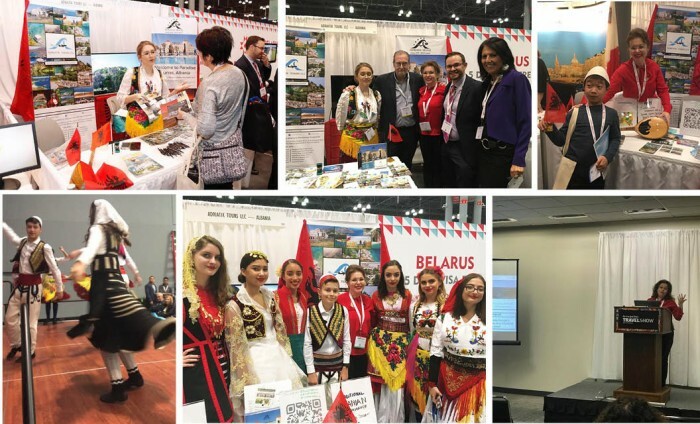 Standard 577 in the European Sector, proudly represented Albania, in front of a large number of visitors and professionals interested in learning more about Albania. Question: How did your presentation was conveyed in the American media? We did appear in the NY Times newspaper, on the NY Times Trade show website , on their social media networks, and on television media, as the first US agency that offers Albania as a touristic destination. We were required to have our own press conference the first day, dedicated only to tourism professionals, at 12:00 o'clock, on January 26, 2018, where we had the opportunity to reveal the values of our country, pointing to our 45 minute presentation, what Albania offers as a country, our religions, distinguished Albanian Celebrities around the world, what international media says about our destination. We focused on Albanians as a warm and with hospitality traits nation, who respect foreigners based on our tradition, who are faithful, and can offer plenty of natural attractions to explore. All of these cultural and natural values are incomparable to the wonderful prices you will find in Albania, comparing to Europe, where geographically, we share the same natural beauty and tourist value. Question: What do you think it was of interest to the visitors of the Trade Show ? Do Americans know Albania? Being a neighbor country of Italy and Greece, and offering Tourism for a fraction of our neighbors prices, were the first convincing reason for them, to consider Albania as a new destination . The travel professionals, the journalists who we faced the first day, were well informed about Albania, where geographically our country was located, and also had information about the country. Many of the visitors to our stand, in the following days, were well informed where Albania was, through our brochures, video presentations, because they kindly stated that they did not pay so much attention to the geography, but of course they were curious to know more about Albania, and Albanians. Only because they had contacts before with Albanians , their friends, and they respect Albanians, as honest people and hard workers. Question: What topic was of interest and did attract questions toward , speaking of journalists at the Press Conference? The curiosity of journalists and bloggers at the conference was mostly addressed to airline companies flying to Albania, especially the question whether we have direct flights to New York , which it turned out to be the most commonly asked question for 99% of the people I've met and talked about during all Trade Show days. I was sorry to answer that there is still no direct NY-Tirana flight at that time , but I believe that very soon it will be happening . It’s not a coincidence, that two Executives of the very prestigious Airline companies, attending the Trade Show , headed to our Stand, sharing the same interest, to initiate talks with the Albanian State regarding this topic. The distance from Europe, our organized tours, the history we come from, the languages we speak, the statistics of Americans who have visited Albania to date, how safe is Albania to travel from families, individuals, women who only want to travel, and other visitor questions. An interesting fact , was the special interest of CBS's journalist, Peter Greenberg for Albania, and specifically, a very warm invitation to become part of his show, for the Prime Minister, or the President of Albania. Question: How well do correlate ADRIATIK TOURS LLC business strategy with the NY Times Trade Show as the first initiative of a travel agency that specializes in Albania travel, for the US market? This participation in this important event came after many years of experience in the tourism sector in Albania, with Adriatik Hotel as a wholesale option, and after many months of hard work and preparation to be part . Our participation here comes as a result of the American market study, where interest for Albania is incredibly high. It seems that geographically, America is far away and there is no need to invest in this market from a country like Albania, when American tourists can go to Maldives, Hawaii, Caribbean, to use their beautiful coast , or visit Europe's rich cultural sites. But Americans are also adventurous, they like to explore new places and cultures, and Albania, as a new undiscovered destination , right in Europe, has much to offer on regard. On the other hand, along with the development of "all inclusive" tourism in Albania , generated from the East Europe, where the core of development is its massiveness and its success lies in the increasing the number of charter tourists toward Albania , we insist that Elite tourism must also be developed, which brings out the financial figures of tourism packages rather than their number. So we have set the quality over the quantity of tourists who enter Albania, and bring a lot of social improvements, long term economic growth of our country, healthy growth of quality of hospitality services of our hotel, restaurants, etc. Because American tourists are very demanding for such services. All this must happen to maintain the balance of a small country like Albania, which needs to protect the fragile cultural and historical sites from the massive reach of tourists, but should be combined with selected groups, of Elite tourism coming from US, who especially offer seasonal outreach during Fall , Winter and Spring season, when Albania needs that the most. And America is a very suitable market for this type of tourism development in Albania, and it is the reason why we decided to operate with Adriatik Tours LLC. Although the internet may occasionally allow the arrival of American tourists in Albania, the presence of an Albanian presence in America, positioned in this part of the market, creates a formal communication channel ,for purchasing genuine and affordable packages to Albania. Question: Does ADRIATIK TOURS LLC operate as an incoming and outgoing Tour agency ,offering full services provided by any American Agency? Absolutely our purpose and our main reason, for opening this office in the USA is that we believe in our legal presence in the US market, but currently we see that many Albanians from Albania , are requesting to go to America for tourism, for honeymoon , Businesspeople who want to attend Professional Fairs, bring their kids to the wonderful summer camps here , or enjoy the Caribbean, Bahamas, Mexico and Cuba. Certainly our business in US, this way can grow in figures, and we think that a serious tourist agency, can build easier communication paths for the incoming sector of Adriatik Tours LLC. Adriatik Tours LLC , also operates as an independent American agency, enjoying the number of IATAN, membership in CLIA, ASTA, Virtuoso, as part of the Montrose Travel agency's American network. We also offer special packages for Albanians interested in visiting America, the Caribbean, exotic destinations, Mexico, Cuba, Dominican Republic, Aruba, etc. Cruise Lines trips offers Air travel from Albania to America and vice versa at very competitive prices, accommodation in partner hotels such as America, Albania or Europe and Asia, car rental etc. Question: To whom do you dedicate this experience and what else do you want to say? This experience was valuable and connected to many factors and people who contributed to its success. Especially, for this first participation in the New York Time Travel Show, we thank the publishers of Blue Editions, Travel Magazine, for our PR material support, their social media support , brochures, calendars, magazines,. Thanks, to what is more important to me, my family, who supports and always offers unconditional help to me. A lot of gratitude and thanks to Rozafati Group, Angjelina Nika , all the kids and their parents, for their wonderful and colorful performance during both days of the show in the European Stage. Adriatik Tours LLC welcomes you to its NYT Travel Show stand next year!